Egg Vending Machine it sounds a little weird right? Most of the vending machine in the world today sells soft-drink, snacks or even cigarettes but have you heard about a vending machine that sells egg? 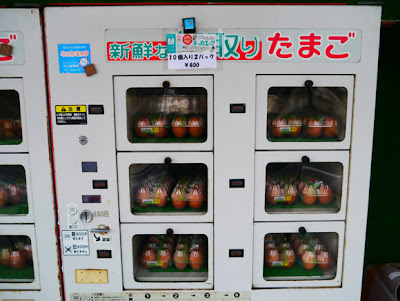 an Egg vending machine or they called it a tamago machine can only found in japan. 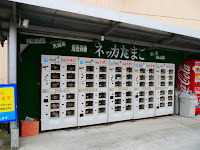 How to use the Egg Vending Machine? It's really simple you just have to put your coins in the slot and push a button. However, for obvious reasons, the eggs aren’t pushed over the shelf into a drop compartment like normal beverage or snack vending machines. Instead, each carton of eggs are places in individual compartments with plastic doors that pop open when you push the button. 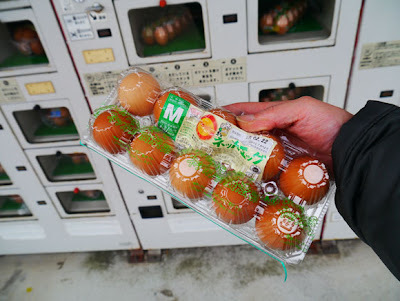 The vending machine is separated by sizes small (200 yen) and medium (400 yen), though “medium” is just 2 of the small 10 egg packs in one compartment. 200 yen (US $2.52) for 10 eggs may be on the slightly expensive side for eggs, but they’re of a trusted brand and worth every yen. Maybe in the future an egg vending machine will be installed in many public places. Watch the Video below about how to operate this Egg Vending Machine.